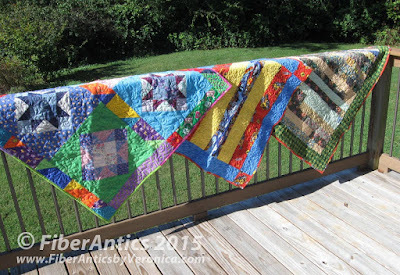 Like many quilt guilds, my guild, the Choo Choo Quilters, has a community service project. 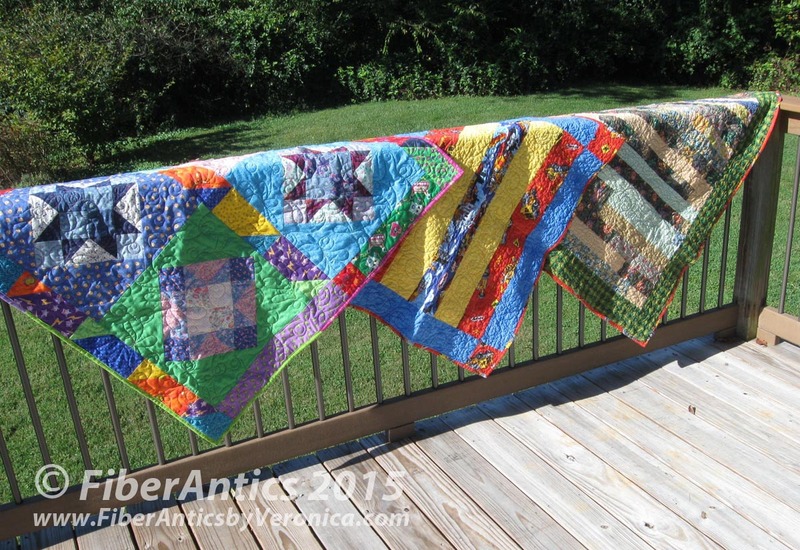 We make lap size quilts for a local children's agency. These two cuddle quilts were completed in August after our annual guild Cuddle Quilt workshop (an all-day sew-in and get-together). 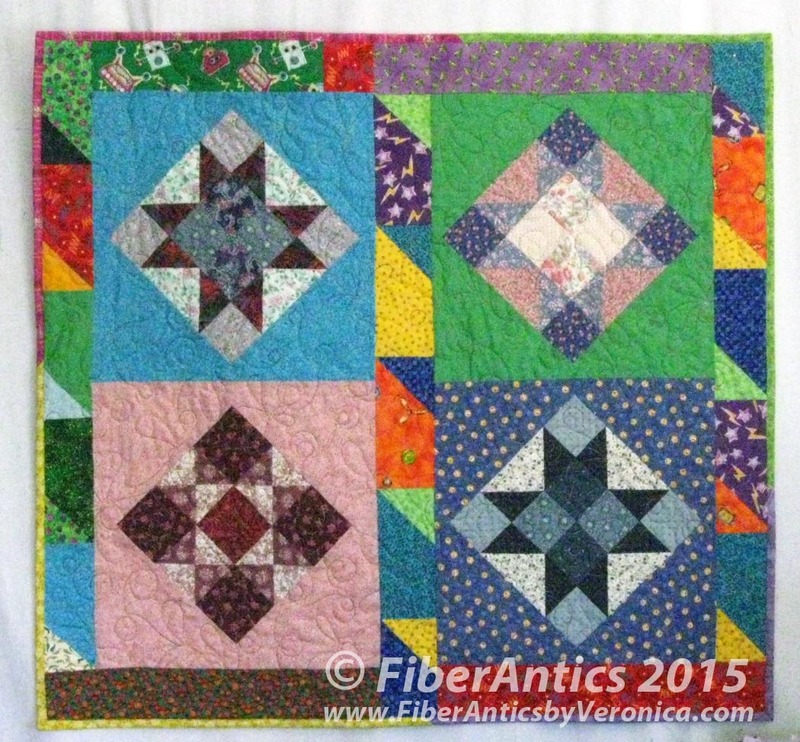 While tidying my studio recently, I uncovered this quilt top, made with 4 orphan blocks and miscellaneous scraps. Oh gosh, I think I pieced this top 4 or 5 years ago. See what a little house cleaning will do?? Lap quilt made from 4 orphan blocks. There were three 10" blocks and one 9" block leftover from two previous projects. How to make them fit together? Turn them on point, "sash" with over-sized corner triangles, and let them float. This made four 15" blocks and the basis for a good-sized lap quilt. Can you tell which is the smaller block? The top got machine quilted and bound [by machine] this weekend and these three cuddle quilts will be turned in at the next guild meeting. Finito! Nope… no Slow Stitching on this project. This is rapid-fire post #6 and 2 days until Chattanooga AQS QuiltWeek® opens. 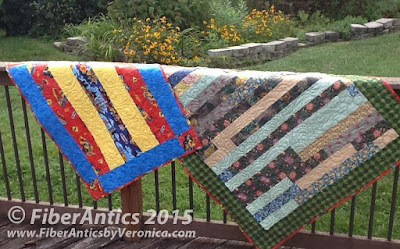 I've volunteered to help hang the quilts in the show, so I'll get a sneak peek.